After being dumped by her boyfriend, an emotionally shaken 17-year-old high school senior makes friends with an angry young man and discovers that the secure family she always considered rock-solid is riddled with lies and secrets. This is a story about familial ties-ties of blood, ties of love, ties that bind. It’s also about family lies and the way these lies affect core connections. Although protagonist Emily Sinclair’s family is small, it’s complex and is comprised of a variety of household situations: intact, divorced, step, gay, straight, illegitimate and adoptive. The story… is set in motion when Emily’s grandfather dies, and the family learns that he had both a longtime mistress and an illegitimate daughter. 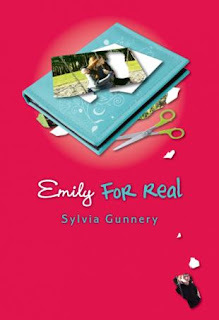 And that’s not even the tip of the iceberg when it comes to the Sinclair family’s surprising but believable secrets, and their eventual revelation shocks Emily to the quick. The other story thread concerns Emily’s realistically depicted budding friendship with Leo Mac, a new classmate with a plateful of family problems of his own, and their testy but ultimately supportive relationship. I was very much looking forward to seeing this second tale about Giraffe and Bird. I so enjoyed Rebecca Bender’s first story about the two (dare I say it?) friends. They were funny the first time, and she is able to keep the humor fresh. …The artwork is so expressive and appealing to the book’s young audience. They will see the emotional reactions of each character clearly and know just how they are feeling. The colors are bright, the setting is lush and lovely, and the characters close-up and personal. I think that my favorite is a double page spread of the two friends facing the sadness of Giraffe’s gaffe and the solution. But, I also love the constantly changing design and the many perspectives that give this funny (and tender) story life. As with the first, the author makes some sparkling decisions about word choice, encouraging an expressive and engaging shared reading. We can only hope that we will meet these two again! “WHY KIDS WILL LOVE IT: The relationships in Don’t Laugh at Giraffe cleverly reflect the often-confusing relationships kids have with other kids. Figuring out how to be with others is tricky for children, and they will likely welcome the conversation the book can inspire. Bender’s illustrations are gorgeous, colourful and lively. Youngsters who first met this delightful animal odd couple in Giraffe and Bird…will be pleased that the sometimes squabbling duo are back again in another story about friendship. 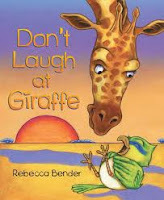 As author/illustrator Bender demonstrated in Giraffe and Bird, she knows when a picture, rather than words, should carry the story. …A fun read, but one which still speaks to the meaning of friendship. Dave Jenkinson, CM‘s editor, livesin Winnipeg, MB.